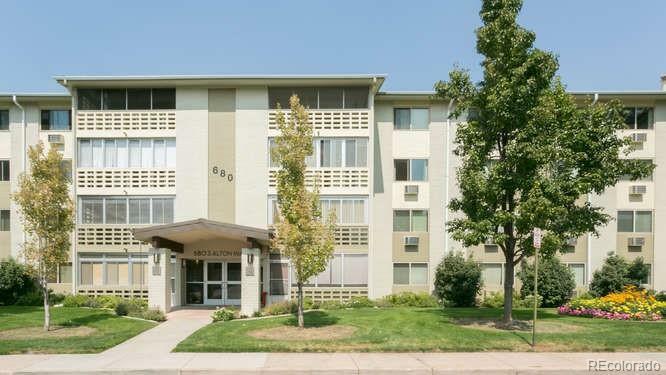 Fully remodeled 3rd floor, end unit condo with enclosed balcony (Southwest facing). BRAND NEW cabinets, granite countertops and tile in kitchen and bathroom. New carpet and laminate flooring. Updated appliances. This unit is a 2 bedroom, 1 bathroom with a one car detached garage and a storage unit on the same floor. Free over-the-air TV. Windsor Gardens offers numerous amenities including indoor and outdoor pools, par 3 golf course with pro shop, restaurant, gym and indoor hot tub. Five minute walk to High Line Canal Trail. The HOA provides 24-hour security. RTD bus stop right in front of building. Taxes included in HOA! This is a 55+ community.